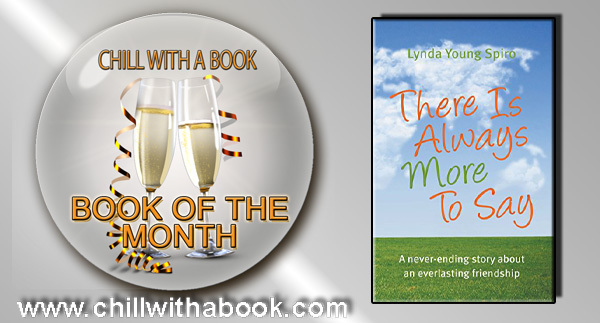 I was thrilled when ‘There Is Always More To Say’ was honoured with a Chill with a Book Award at the end of last year. But to say that I was totally overwhelmed when I heard that it had been named Book of the Month for December 2016 is an understatement! It’s been a great start to the year. I’ve had the most amazing response to my requests that I’m continuously sending to ask bloggers to read and review ‘There Is Always More To Say’. I pay a lot of attention to the reviews that I get. To each and every one of them. I appreciate the time that someone has taken to sit and compose a review. I want my readers to enjoy the story and reading the nice reviews is really, really lovely. At times I’ve been quite overwhelmed. I’ve been very touched by many lovely comments. And when a review is critical, if the same comment turns up more than once, I’ll have a think about if there’s a good point there and take note of it, and hopefully, learn from it. I’ve included the links to a couple of recent postings from bloggers. But now I’d like to write my own review! Last weekend we went on a family outing. All four of us. It was the first time that we had all been together since last October. Three months ago. We went to see Buried Child at Trafalgar Studios. My son, James, had studied it for A-level nine years ago and he really wanted us all to see it. It was definitely a darker subject than I normally would have chosen. But I thoroughly enjoyed it. It tells the story of a family who is keeping a tragic family secret ‘buried’ from the public and from each other. That is, until the arrival of the young grandchild, who disturbs the dynamic and makes some of the characters reveal their deepest and darkest fears to one another. It’s on at Trafalgar Studios until the end of February. Tags: Book of the Month!